You may wonder if there are any Vegas family attractions… but what about kids? Many people think that the “Sin City” is an ideal tourist destination for adults only due to its very active nightlife and gambling. Well, that’s what my husband and I thought too before visiting it. You will be surprised by the many family friendly attractions and things to do in Las Vegas. There are lots of kid-friendly spots that will make this city one of your favorite family vacation destinations if not the most favorite. 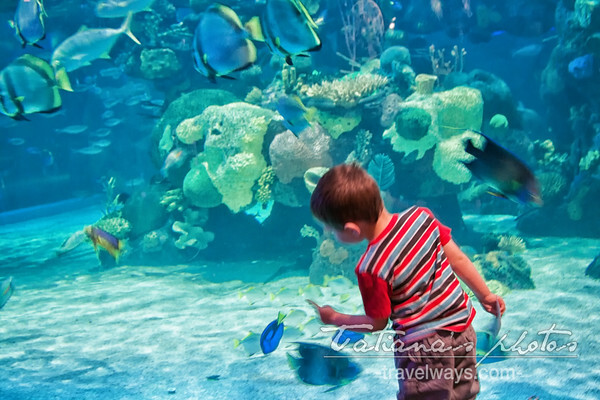 The Silverton Aquarium is a perfect destination if you are visiting Las Vegas with kids, and it’s totally FREE. Make sure to allocate at least five hours to this visit. Personally, I lost track of time just by watching the exotic fish swimming in the colorful aquarium, which by the way are over 4,000 in number and belong to over 150 species of fish from around the world. There is also a mermaid show in which beautiful ladies donning mermaid gear swim in the aquarium, doing fun stunts while interacting with the kids watching them from the outside. I left this place feeling like hitting my head really hard for lying to me that Vegas was not for kids. This is a family water fun package at Lake Mead National Recreation Area Las Vegas, near Hoover Dam. This package is for all levers of experience with water sports and you can choose from waterskiing, wakeboarding, or wakesurfing. Yes, the transportation to the place is included and you will be pickup from your hotel in Las Vegas. This three-story building promotes art, science and culture in such a striking and unique way that your kids will not want to leave. It has nine themed exhibition halls with interactive exhibits and lots of great hands-on activities for kids. Water World is one of the interactive exhibits where children engage in a wet and wild adventure as they learn about the movement and power of water. Eco City is a mini city where kids can run errands just like adults. Speaking from experience, your kids will want to run all over the place soon after you enter the building. You’ll therefore have to be on your toes to keep them under control. Bellagio hotel and casino is one of the most family oriented hotels in Las Vegas, with permanent and seasonal FREE things to do and see for families and kids. The world’s largest chocolate fountain is a permanent wonder located in the Bellagio hotel lobby. It’s right after you pass the famous Botanical Garden and Conservatory, which is another marvel to see, especially if you are taking a vacation with kids (See the pages on seasonal themes at Bellagio). The gourmet fountain displays tree amazing streams of chocolate: white, mocha and black, falling from the ceiling to the floor. Yes, you can taste it too :) The mouth watering patisseries and cookies are displayed right there waiting to delight you. You can also buy some for the loved ones left home. What better way to prove how life sweet is other than visiting the Ethel M Chocolate Factory, the only one in the world. (Located in Henderson). Take a FREE tour of the factory to let your kids see the process through which chocolate is prepared, textured and shaped. You should however be ready to be greatly teased and tempted to near breaking point by the sweet smell of the chocolate. You’ll breathe a huge sigh of relief when you get to the retail area where you can get a sample of your favorite chocolate. Next to the factory is the Botanical Cactus Garden. This three acre-garden features over 300 types of cactus which include yuccas, spotted aloe and Texas prickly pears. The Secret Garden is one of the greatest Vegas family attractions for kids to explore… They can see big cats including white tigers, lions and leopards. The tropical surroundings will make you feel as if you are in a real jungle. Your kids can also take the cats back home with them (don’t panic) – by getting souvenirs from the gift shop (you must be quite relieved to hear that). You and your kids can get an up-close look at dolphins and learn more about them at the Dolphin Habitat. There is an underwater viewing window from which you can take great photographs. You can also choose to create a unique masterpiece with a dolphin or even be a trainer for a day. There is a gift shop where you can buy dolphin toys for your kids. Located at the Mandalay Bay Hotel, Shark Reef gives an aquatic experience similar to that of you being in an ocean. It is home to over 1,200 different species of marine animals. The shark tunnel consists of different types of sharks such as the zebra sharks, lemon sharks, sand tiger sharks and nurse sharks. At first, some of the sharks can be quite frightening to look at due to their size and appearance. You’ll soon get used to them after seeing them swim around while posing no threat at all to anyone including the smaller sharks. Other animals found at the Shark Reef include piranhas, freshwater fish, crocodiles, a 300-pound turtle and an 8-foot-long Komodo dragon. The Shark Reef will keep your kids entertained for at least one hour.